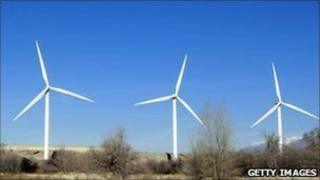 The Isle of Man must strive to reduce its energy dependency according to Environment Minister John Shimmin. The statement follows the publication of a report by consultancy firm AEA, detailing renewable energy options for the Island. The report was commissioned by Tynwald to advise the Manx government on how to develop future energy policies. John Shimmin said: "We must take control of our energy consumption and tap into in the renewable field." He added: "One of the areas we are considering is on-shore wind generation but we need to see if we can actually afford it without it having a negative impact on current energy prices." The report says significant investment is needed if the island is to achieve its target of having 15% of electricity generated from renewable sources by 2015. It expresses concern that there appears to be "no fiscal or economic incentives to promote renewables on the island". Mr Shimmin said: "I remain optimistic we can make those commitments, the capacity is there and the technology is there. "Individuals on the island must look at their own energy use and be more energy efficient."